On 21st September, 1939, Reinhard Heydrich told several Schutz Staffeinel (SS) commanders in Poland that all Jews were to be confined to special areas in cities and towns. These ghettos were to be surrounded by barbed wire, brick walls and armed guards. The first ghetto was set up in Piotrkow on 28th October 1939. Jews living in rural areas had their property confiscated and they were rounded up and sent to ghettos in towns and cities. The two largest ghettos were established in Warsaw and Lodz. In October 1939, the SS began to deport Jews living in Austria and Czechoslovakia to ghettos in Poland. Transported in locked passenger trains, large numbers died on the journey. Those that survived the journey were told by Adolf Eichmann, the head of the Gestapo's Department of Jewish Affairs: "There are no apartments and no houses - if you build your homes you will have a roof over your head." In Warsaw, the capital of Poland, all 22 entrances to the ghetto were sealed. The German authorities allowed a Jewish Council (Judenrat) of 24 men to form its own police to maintain order in the ghetto. The Judenrat was also responsible for organizing the labour battalions demanded by the German authorities. Conditions in the Warsaw ghetto were so bad that between 1940 and 1942 an estimated 100,000 Jews died of starvation and disease. At the Wannsee Conference held on 20th January 1942, Reinhard Heydrich chaired a meeting to consider what to do with the large number of Jews under their control. Also at the meeting were Heinrich Muller, Adolf Eichmann and Roland Friesler. Those at the meeting eventually decided on what became known as the Final Solution. From that date the extermination of the Jews became a systematically organized operation. It was decided to establish extermination camps in the east that had the capacity to kill large numbers including Belzec (15,000 a day), Sobibor (20,000), Treblinka (25,000) and Majdanek (25,000). Between 22nd July and 3rd October 1942, 310,322 Jews were deported from the Warsaw ghetto to these extermination camps. Information got back to the ghetto what was happening to those people and it was decided to resist any further attempts at deportation. In January 1943, Heinrich Himmler gave instructions for Warsaw to be "Jew free" by Hitler's birthday on 20th April. Warsaw contained several resistance groups. The largest was the Polish Home Army. There was also the Jewish Military Union and the communist Jewish Fighter Organization (ZOB) led by Mordechai Anielewicz, Yitzhak Zuckerman, Gole Mire and Adolf Liebeskind. On 19th April 1943 the Waffen SS entered the Warsaw ghetto. Although they only had two machine-guns, fifteen rifles and 500 pistols, the Jews opened fire on the soldiers. They also attacked them with grenades and petrol bombs. The Germans took heavy casualties and the Warsaw military commander, Brigadier-General Jürgen Stroop, ordered his men to retreat. He then gave instructions for all the buildings in the ghetto to be set on fire. As people fled from the fires they were rounded up and deported to the extermination camp at Treblinka. The ghetto fighters continued the battle from the cellars and attics of Warsaw. On 8th May the Germans began using poison gas on the insurgents in the last fortified bunker. About a hundred men and women escaped into the underground sewers but the rest were killed by the gas. It is believed that only 100 Jews survived the 1943 ghetto rising. In the summer of 1944 the Red Army began to advance rapidly into German occupied Poland. The advancing Soviet troops refused to accept the authority of the Polish government-in-exile and disarmed members of the Polish Home Army they met during the invasion. The Polish government-in-exile in London feared that the Soviet Union would replace Nazi Germany as occupiers of the country. On 26th July 1944 the Polish government secretly ordered General Tadeusz Komorowski, the commander of the Polish Home Army, to capture Warsaw before the arrival of the advancing Russians. Five days later Komorowski gave the orders to rise up. The Home Army had about 50,000 soldiers in Warsaw. There were a further 1,700 people who were members of other Polish resistance groups who were willing to join the uprising. The men were desperately short of arms and ammunition. It is estimated they had 1,000 rifles, 300 automatic pistols, 60 sub-machine-guns, 35 anti-tank guns, 1,700 pistols and 25,000 grenades. The army also had its own workshop and were attempting to produce pistols, flame-throwers and grenades. On the first day of the rising on 1st August, 1944, the Poles managed to capture part of the left bank of the River Vistula in Warsaw. However, attempts to take the bridges crossing the river were unsuccessful. German reinforcements arrived on the 3rd August. The German Army used 600mm siege guns on Warsaw and the Luftwaffe bombed the city around-the-clock. British and Polish airmen flew in supplies from bases in Italy but it was difficult to drop the food and ammunition to places still in the hands of the rebels. The Royal Air Force and the Polish Air Force made 223 sorties and lost 34 aircraft during the uprising. Heinrich Himmler gave instructions "that every inhabitant should be killed" and that Warsaw should "be razed to the ground" as an example to the rest of Europe under German occupation. As soon as territory was taken the Nazi's took revenge on the local people. In the Wola district alone an estimated 25,000 people were executed by firing squad. When the Old Town was taken by the German Army on 2nd August, the Polish resistance fighters were forced to flee via the sewer canals. This network of underground canals were now used to move men and supplies under enemy controlled areas of Warsaw. On 20th August the Polish Home Army captured the Polish Telephone Company building and the Krawkowskie Police Station. Three days later they took control of the Piusa Telephone Exchange. On 10th September the Red Army led by Marshal Konstantin Rokossovy, entered the city but met heavy resistance. After five days Soviet forces had captured the right bank of the city. Rokossovy then halted his troops and waited for reinforcements. However, some historians have argued that Rokossovy was following the orders of Joseph Stalin, who wanted the Germans to destroy what was left of the Polish Home Army. 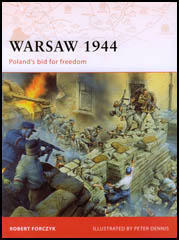 The insurgents were forced to leave Czerniakow on 23rd September. Three days later they were forced to leave the Upper Mokotow area via the underground sewers. On 30th September General Tadeusz Komorowski appointed General Leopold Okulicki as head of the Polish underground. Running out of men and supplies General Komorowski and 15,000 members of the Polish Home Army were forced to surrender on 2nd October 1944. It is estimated that 18,000 insurgents were killed and another 6,000 were seriously wounded. A further 150,000 civilians were also killed during the uprising. After the Polish surrender the German Army began to systematically to destroy the surviving buildings in Warsaw. By the time the Red Army resumed its attack on Warsaw, over 70 per cent of the city had been destroyed. Over the next few weeks the Soviet forces took control of the city. There are no apartments and no houses - if you build your homes you will have a roof over your head. There is no water. The wells are full of epidemics. There's cholera, dysentery, typhus. If you dig for water, you'll have water. Jewish masses, the hour is drawing near. You must be prepared to resist. Not a single Jew should go to the railroad cars. Those who are not able to put up active resistance should resist passively, should go into hiding. Do not go willingly to your death! Fight for life to the last breath. Greet our murders with teeth and claws, with axe and knife, hydrochloric acid and iron crowbars. Make the enemy pay for blood with blood, for death with death? Let us fall upon the enemy in time, kill and disarm him. Let us stand up against the criminals and if necessary die like heroes. If we die in this way we are not lost. Make the enemy pay dearly for your lives! Take revenge for the Jewish centres that have been destroyed and for the Jewish lives that have been extinguished. (4) Alexander Donat was in the Warsaw ghetto during the rising. He later recalled what happened. When we reached Niska Street, the fighting was still going on; from roofs, from the windows of burning buildings, from doorways. Suddenly Lena clutched my hand and squeezed it with all her might. A blood-curdling scream rang out from an upper-story window filled with flames where a woman appeared holding a child by the hand, and toppled down to the street. This was our last sight of the Warsaw ghetto. 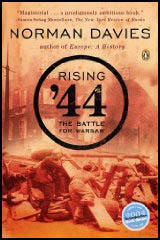 (5) Jürgen Stroop wrote a report on the Warsaw Uprising after it had taken place in 1943. During the armed resistance, females belonging to fighting groups were armed just like the men. Some of them were members of the Hehalutz movement. Not infrequently, these females fired pistols from both hands. Repeatedly, they concealed pistols or hand grenades (oval Polish hand grenades) in their underpants to use at the last minute against the men of the Waffen SS, police, or Wehrmacht. The resistance offered by the Jews and bandits could be broken only by the energetic and relentless day and night commitment of our assault units. On 23 April 1943, the Reichsfuhrer SS promulgated his order, transmitted through the Higher SS and Police Leader East in Krakow, to complete the sweeping of the Warsaw Ghetto with greatest severity and unrelenting tenacity. I therefore decided to embark on the total destruction of the Jewish quarter by burning down every residential block, including the housing blocks belonging to the armament enterprises. One enterprise after another was systematically evacuated and destroyed by fire. In almost every instance, the Jews then emerged from their hiding places and bunkers. It was not unusual for Jews to remain in the burning houses until the heat and their fear of being cremated forced them to jump from the upper floors. They did so after throwing mattresses and other upholstered items into the street. With broken bones, they still tried to crawl across the street into housing blocks that had not yet been set on fire or were only partly in flames. Jews often changed their hiding places during the night, moving into already burned-out ruins and finding refuge there until they were found by one of our assault units. Nor was their stay in the sewers very pleasant after the first eight days. Frequently, the sewer shafts carried loud voices upward to the streets, whereupon men of the Waffen SS, Police, or Wehrmacht Engineers courageously climbed down the shafts to bring out Jews. Not infrequently the Engineers would stumble over dead Jews or be shot at. It was always necessary to use smoke candles to drive out the Jews. On one day alone, at a predetermined hour, 183 sewer gates were opened and smoke candles lowered. The bandits fled from what they thought was gas toward the center of the former Jewish quarter, where they were pulled out of the sewer holes. An indeterminable number of Jews were finished off when sewers and bunkers were blown up. The longer the resistance lasted, the tougher became the men of the Waffen SS, police, and Wehrmacht, who tirelessly fulfilled their duties in true comradeship and stood together as exemplary soldiers. Their mission often lasted from early morning to late at night. Nightly search patrols, with rags wrapped around their feet, dogged the Jews and gave them no respite. Jews who used the night to supplement their provisions from abandoned bunkers and to make contact or exchange news with neighboring groups were often brought to bay and finished off. Considering that the greater part of the men of the Waffen SS had been trained for only three or four weeks before this operation, they must be given special recognition for their daring, courage, and devotion to duty. It must be noted that the Wehrmacht Engineers also executed their tasks of blowing up bunkers, sewers, and concrete houses with tireless devotion. The officers and men of the police, many already with experience at the front, again acquitted themselves with devil-may-care valor. Only the continuous and tireless commitment of all forces made it possible to apprehend and/or destroy 56,065 Jews. To this confirmed number must be added the Jews who lost their lives in explosions, fires, etc., whose number could not be ascertained. (6) Mordechai Anielewicz, one of the leaders of the uprising wrote to his friend, Yitzhak Zuckerman, on 16th April, 1943. It is impossible to describe the conditions reigning in the ghetto. Very few could bear all this. All the others are destined to perish sooner or later. Their fate has been sealed. In most of the bunkers where thousands of Jews are hiding it is impossible to light a candle because of the lack of air. What we have experienced cannot be described in words. We are aware of one thing only; what has happened has exceeded our dreams. The Germans ran twice from the ghetto. Perhaps we will meet again. But what really matters is that the dream of my life has come true. Jewish self-defence of the Warsaw ghetto has become a fact. Jewish armed resistance and retaliation have become a reality. I have been witness to the magnificent heroic struggle of the Jewish fighters. For a week we have been involved in a life-and-death struggle. The Warsaw Ghetto, the last of all the ghettos, was suddenly surrounded on the night of April 19th by the regular German Army which has begun the liquidation of the remaining Jews. In the first two days the Germans, after suffering great losses, were forced to beat a retreat. Later, after receiving reinforcements of tanks, armored cars, guns and finally aircraft, they began a regular siege of the ghetto and the systematic burning of all the houses. Our losses are enormous, taking into account the number of victims of shooting and of the fires in which men, women and children perished. Our end is imminent. But while we are in possession of arms we shall continue to resist. We have rejected a German ultimatum to capitulate because the enemy knows no pity and we have no choice. As we feel our last days approaching, we ask you to remember how you have betrayed us. The day will come for us to be avenged for the shedding of our innocent blood. Help those who at the last moment will slip through the enemy hands to carry on the struggle. The Warsaw rising had begun on August 1st. It was set off by the local Polish commander without consultation with us and without co-ordination with the Soviet forces advancing on the city, though the Poles had tried, and continued to try, to establish contact with the Russians. However, the Soviets had themselves a direct responsibility, for it was their organization, the so-called Union of Polish Patriots, which had called on the population to rise on July 29th. When Mikolajczyk arrived in Moscow two days later, Stalin promised that he would send help to the insurgents. It is true that a German counter-attack held up the Soviet advance and that it was not the Russian habit to assault a city frontally. Yet, when all is said, the conclusion seems inescapable that Stalin, surprised by the vigour and success of the rising, was content to see the underground and the remaining political and intellectual leaders of Poland destroyed. It did not suit him that the Poles should liberate their capital themselves; nor could he allow Mikolajczyk and his followers to return to Poland with their underground organization intact. He now refused to let American aircraft land on Soviet airfields after dropping supplies on Warsaw. British aircraft, many with Polish pilots, flew to their extreme range from the Mediterranean, but could hardly affect the issue.